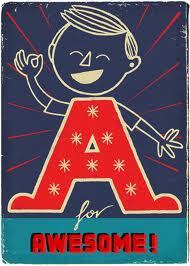 Paul Thurlby’s Alphabet Book (made of paper!) started out as a blog-based art project. I didn’t know that when I read it to my 3 year old for the first time tonight. I just thought the retro-modern style was cool and reminded me of the art of Vault-Tec (only less apocalyptic). It turns out that that Thurlby worked on this series, letter by letter, and garnered the attention of other illustration and art bloggers, until one day a literary agent saw his work online and contacted him. His work is now in the Tate Modern (one of my favourite places in the world). We talk a lot about paper books being e-ified, either into ebooks or apps, but this one’s an example of a digital project going the way of the tree. It is more of an art book, though, and I think is better appreciated by adults than children. A for awesome, indeed! Posted on September 29, 2012, in eBook and tagged Paul Thurlby. Bookmark the permalink. 2 Comments. Karen! Oh my GARSH that sounds like something RIGHT up my alley. Will try to be there.